A dishwasher is integrated into the back of the island, while a second dishwasher is found in the scullery of this new home. 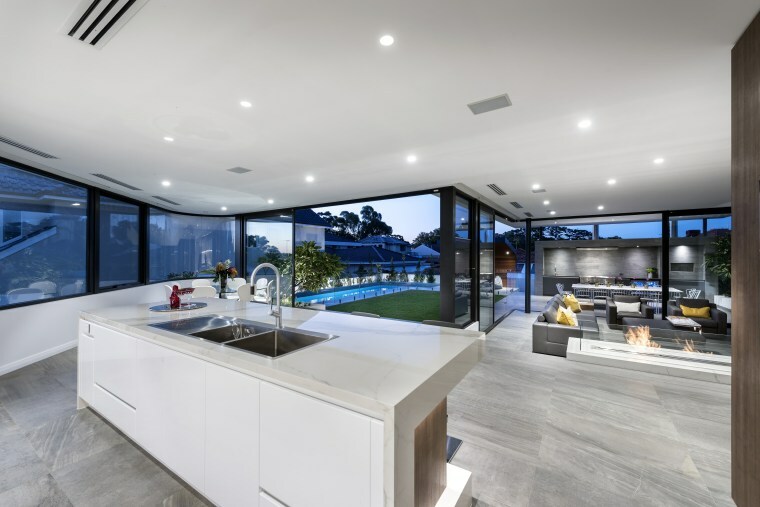 The kitchen is designed so the chef can talk to guests on the island stools or in the living areas or enjoy the view out to the garden and pool beyond the wall-height sliding doors. The open fireplace just across from the kitchen is finished in the same marble-look porcelain panels as the island creating a sense of balance through the large, open plan area. It's a simple balancing act you want your kitchen to have refined surfaces but then you don't want to labour away your hours cleaning everything down when the party or even family breakfast is over. 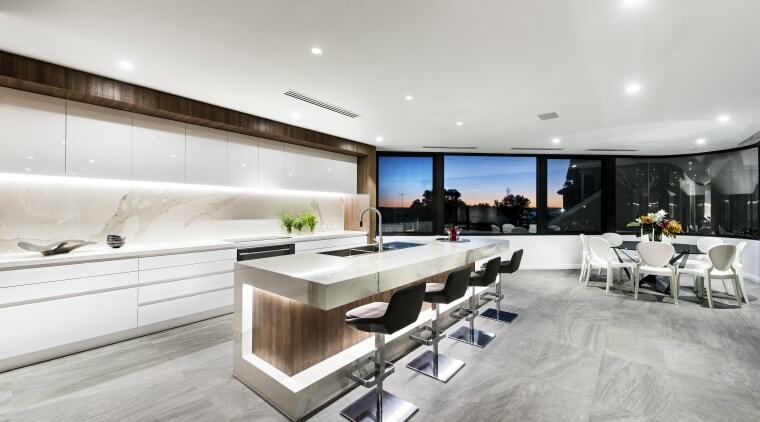 This large kitchen is set directly across from the living spaces in a three-level riverside home created by Urbane Projects with Steve Gliosca as architectural designer. "The home is set up for entertaining on a large scale as well as catering to the needs of a young family," says Gliosca. "As such it had to look glossy and upmarket and yet stand up to day-to-day use." 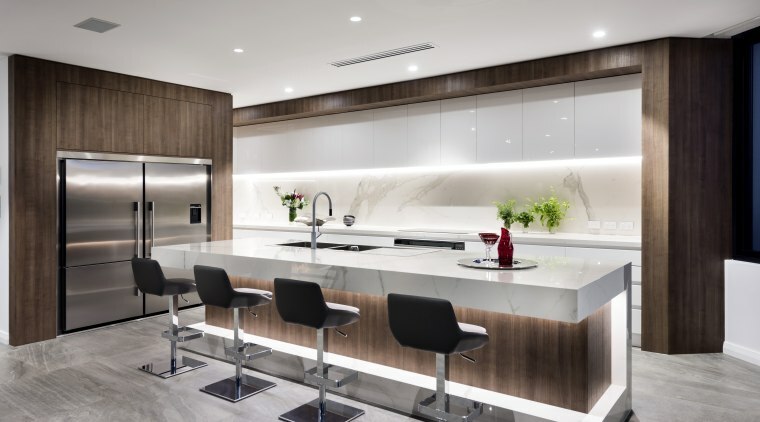 And it was this double-requirement that led Gliosca to create the feature island and cabinetry in marble-look pressed porcelain panels, matched with a durable wood-look laminate product and wipe-down two-pac cabinetry paint finish. 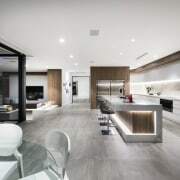 The same porcelain panels are used to clad the fireplace opposite, and the laminate is also repeated on cabinets in the living area, creating balance through the interior. 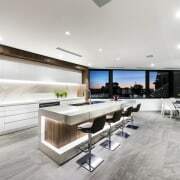 In this new home by Urbane Projects the dramatic LED-lit island with its sculptural folding planes is a stand-out feature and helps define the kitchen zone. 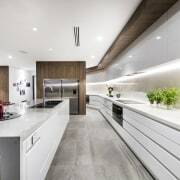 "The match of wood-look laminate and marble-look surfaces creates an eye-catching two-tone aesthetic which is also used to delineate the kitchen. 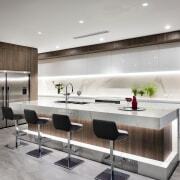 A band of the dark brown laminate separates the perimeter upper cabinetry from the white ceiling." And the interplay of surfaces isn't the only stand-out element in the kitchen. The large island is positioned out towards the living spaces and features a dense counter-top that appears to wrap back, downwards and out again at floor level to form a footrest for the island stools. Sets of concealed LEDs highlight the island's sculptural form. Another aesthetic consideration came from a spiral staircase which is the central feature of the home. The curves from this stair are intentionally echoed in the curving landscape window beside the kitchen and living spaces and by the curvaceous wall that helps shape the rear scullery. Along with stand-out good looks, the kitchen delivers big-time on functionality. This panoramic window and the kitchens scullery wall are shaped to echo the home's spiral staircase. "The kitchen boasts large fridges in the end joinery block, which also forms the outer wall of the large walk-in scullery," says Gliosca. "The scullery continues the finishes of the perimeter cabinetry and has a second oven, second dishwasher and a wealth of bench space. As the scullery is only seen from the rear of the kitchen it was felt a door was unnecessary. "The owners frequently entertain on a large scale and having an easy flow from prepping scullery to living area was a must. There are also lots of cupboards to hold large platters, such as in the high cabinets above the fridges." Upper wall cabinets hide a minimalist, quiet rangehood with its motor on the roof.